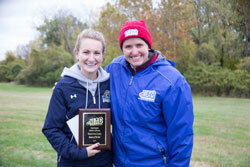 Sophomore Shelby McIntyre earned NEAC Runner of the year honors after finishing the 6k championship course in first place with a time of 22:28. With a total score of 75, the Wildcats placed second overall improving on their third place finish from a year ago. > Read the full article on the Wildcats Athletics website.